Catherine Andras (1775-1860) was born in Bristol, but moved to London to work. She exhibited in the capital from 1799 onwards, and in 1802 was appointed Modeller in Wax to Queen Charlotte. In the same year she was awarded 'The Larger Silver Pallet' by the Society for the Encouragement of Arts, Manufactures and Commerce for her model of Princess Charlotte and this one of Lord Nelson. She was active until 1855. 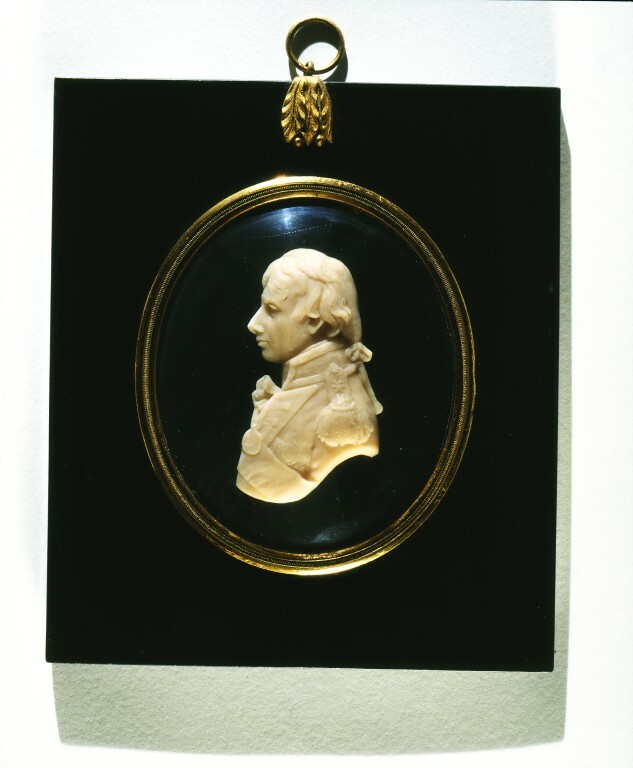 Wax portraits were particularly popular in Britain in the second half of the 18th century. They were often modelled from the life; a mould could be made from this initial model, from which further copies could be cast. The waxes were small and portable, and the nature of the material meant that they were extremely naturalistic. Sometimes they were coloured, and extra items added, such as textiles, seed pearls or coloured glass, to increase the life-like appearance of the portrayal. 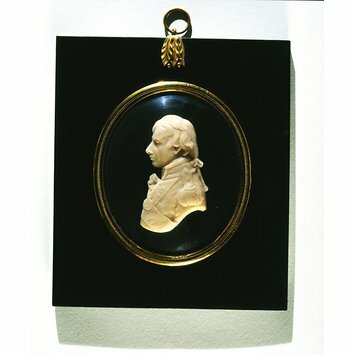 The profile relief, in pale pink wax on black glass of Lord nelson is shown facing to the left. He is shown wearing naval uniform with epaulettes, insignia and medal and a long wig, tied at the back of his neck with a ribbon. In 1802 Catherine Andras was awarded the Larger Silver Pallet by the Society for the Encourgement of Arts, Manufacture and Commerce for models in wax of Princess Charlotte and Lord Nelson. Pyke, E.J. A Biographical Dictionary of Wax Modellers, Oxford, 1973, p. 5.